Next, the Republicans make it sound like federal law prohibits selling insurance across state lines. Nope. That, too, is up to the states. As this article explains, five states (Georgia, Kentucky, Maine, Rhode Island, and Wyoming) already allow out-of-state insurers to sell health insurance policies within their borders. But here’s the thing: Not one insurer has taken advantage of the opportunity. That’s because it’s too difficult to move into unfamiliar territory and create a provider network from scratch. Plus, the big insurers (Aetna, Humana, Kaiser, United Healthcare, etc.) are already licensed in multiple states. (For a good overview of what happened in Rhode Island, see this NPR essay). One more thing: Eighty-four percent of Americans who receive health insurance through their employer are in self-insured plans. This means your employer sets aside money, including the premiums you pay, to cover medical costs, rather than the insurance company. The employer then contracts with an insurer to handle the administrative side of things. Companies do this because it results in significant cost savings. These plans are not subject to state laws, which means they don’t need to be licensed in the states in which they operate. It also means that, by their very nature, there is no competition to drive down costs since the employer provides the health insurance directly. 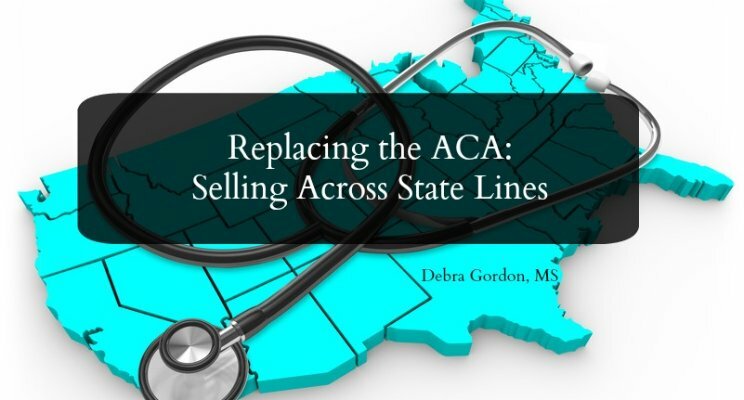 What Might Health Insurance Sales Across State Lines Look Like? So let’s assume, for a minute, that all states open their borders to interstate insurance sales (and the ACA, with its minimum coverage requirements and premium protections has been repealed). An insurer only has to be licensed in one state but can sell its product in any state it wants without meeting that state’s requirements. Now let’s assume that Mississippi (not meaning to pick on Mississippi, I just like spelling the name) allows bare-bone plans with few benefits or consumer protections in order to lure as many insurers as possible into the state. Now those insurers can sell cheap, bottom-of-the-barrel plans everywhere. These plans attract healthy people who don’t need much medical care. Plans with richer benefits, the ones that sicker individuals are drawn to, now have to raise premiums because they are losing the healthy individuals who helped keep premiums more affordable. People who need the plans can’t afford them. Soon, even those plans begin chopping away at benefits in order to remain competitive. Eventually, it becomes a race to the bottom. Plus, if you live in California but your plan is licensed in Mississippi your state’s health commissioner is pretty powerless to do anything if problems arise. And Mississippi might not want to bother investigating claims from out-of-staters. The ultimate irony is that the ACA already allows the sale of insurance across state lines via “health care choice compacts.” These are, basically, agreements into which several states enter. While some states have enacted laws pertaining to the compacts, none have put them into action.